Translated Woman is an account of my friendship with a Mexican street peddler. It was named a Notable Book of the Year for 1993 by the New York Times and received Honorable Mention, Victor Turner Prize for Ethnographic Writing, from the Society for Humanistic Anthropology, in 1994. Translated Woman was adapted for the stage by PREGONES Theater, a Latino theater company based in the Bronx, New York. The stage adaptation, with live music and songs based on the book, has been performed in New Hampshire, the University of Michigan, and the University of Minnesota. The premiere of the work in a commercial venue took place on November 12, 1998 at the Painted Bride Theater in Philadelphia. Translated Woman is widely used in courses in women’s studies, Latin American and Latino studies, anthropology, history, psychology, education, and literature. It has gained a broad readership outside the academy and is frequently mentioned as an essential book on Mexico and on the new turn toward including a personal dimension in humanistic research. 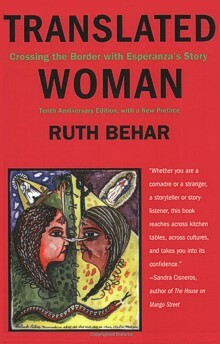 Ruth Behar. “Goodbye, Comadre.” Savage Minds. 6, January, 2015. You can also find Ruth’s essay “Goodbye, Comadre” in the Chronicle Review. “Reframing the Narrative Voice in Educational Research,” by William G. Tierney, Review of Education/Pedagogy/Cultural Studies 16 (1), 1994: 87-92. “Late-Modern Anxieties about Modes of Knowing: Gender Themes,” by Maila K. Stivens, Current Anthropology 36 (4), Aug.-Oct., 1995: 706-709. “Narrative and Psychological Understanding,” by Ruthellen Josselson, Psychiatry 58, November 1995: 330-328. “Personal Testimony: Latin American Women Telling Their Lives,” by Kathleen Logan, Latin American Research Review 32 (1), 1997: 199-211 (extensive discussion of Translated Woman).